ChromeReminders is a Google Chrome Extension that lets you create new reminders in your Backpack account. I use Backpack (37signals) reminders all the time to push out tasks and todos into the future. 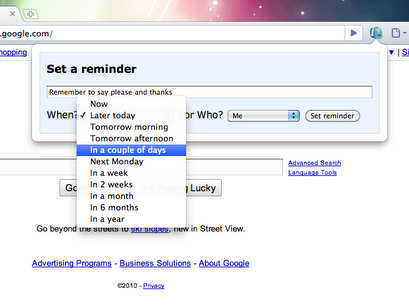 This Chrome extension allows you to create reminders without leaving your current webpage. To configure the extension to work with your Backpack account, install the extension, then inside Google Chrome go into Extensions>Options and enter your Token for the Backpack API which can be found in Backpack > My Info (see screenshot). 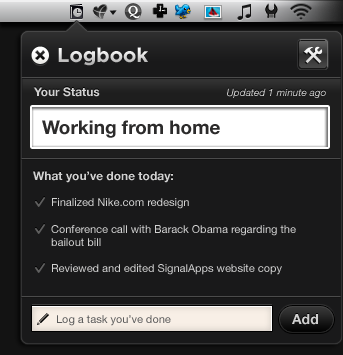 Logbook lets you post your status and log your work on your Backpack Journal right from your Mac. 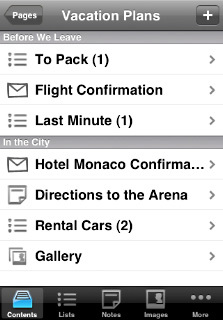 It’s called Logbook, and it makes updating your Backpack® Journal a breeze. For a while now, we've been using Backpack® Journal to keep our team connected and we absolutely love it. Lately, though, we've been getting sick and tired of having to repeatedly open the browser to post quick status updates or completed tasks (not to mention the fact that we often forget to post anything at all). Logbook is a lightweight menubar app that enables any Backpack® user to post Journal status updates and tasks in seconds without ever opening your browser. Try Logbook or learn more about the Backpack Journal. TUAW: "Satchel is Backpack on the iPhone done right"
Satchel is Backpack on the iPhone done right (finally) according to The Unofficial Apple Weblog. 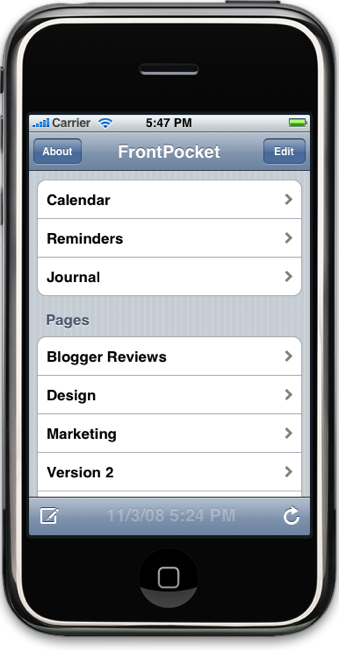 FrontPocket is an iPhone & iPod touch app for Backpack. The web's best organizer and intranet just got better. FrontPocket makes interacting with your entire Backpack account simple and fast with the ability to manage pages, calendars, reminders, and the journal (plus Twitter).